When someone has missing teeth, they know just how essential their dentures are for maintaining a beautiful, healthy-looking smile. And when dentures get damaged, not only are they unattractive–they can also lead to bite-related problems. Because of this, it is important to seek out a dental professional for denture repair services or denture replacement as quickly as possible. Dentures are made to endure some regular wear and tear, but the high-quality resin they are made of is fragile in nature. If it is handled roughly or dropped, it’s possible that the denture will break. In addition, partial dentures sometimes have metal clasps or framework that can either break or become detached from the base. Also, when dentures no longer fit precisely, they have more tendency to break because of the stress placed on them when in the mouth. The bottom line is this: dentures, unfortunately, can and do break–usually at the least opportune time. Because of this, having an experienced dentist to call for quick and effective denture repair services is a must. 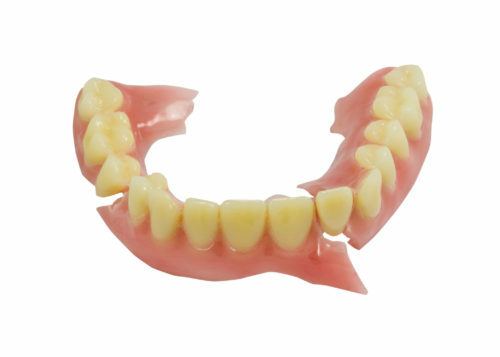 When a denture breaks, it is important to preserve it as carefully as possible. Do not wear a broken denture. It is also beneficial to keep it moistened, wrapped in a clean towel and placed in a sealed container to prevent further damage. We suggest not trying to repair the denture on your own with a kit from a drugstore. Taking it to a trained professional will allow for a highly successful and less expensive repair! Not a patient of Dental Health Associates? No problem! We are here to help you–give our office a call today!